Antiques have been part of Jon Lambert’s life since the age of 10. He’s spent his life learning about antiques, and the antique business. He founded, and is the sole proprietor, of Mebane Antique Auction Gallery. 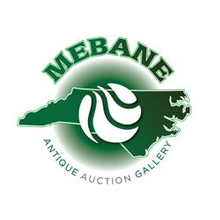 Founded in 1991 and based in Mebane North Carolina, Mebane Auction Gallery is one of the most successful auction galleries in the state of North Carolina, the southeast, and known nationwide. The building is located on NC Highway 70, a Historic Trading Path. The 15,000 sq ft. air conditioned facility has a 6,000 sq ft. gallery, a 3,000 sq ft. show room, and 6 acres for parking. Mebane Antique Auction Gallery has become nationally and internationally known for historically important estate discoveries. Bidders have visited the gallery from as far away as England and Australia. With over 15,000 registered bidders and exhibitions in house and online, Mebane Antique Auction Gallery has become “The Largest Weekly Antique Auction in North Carolina,” averaging 1000 lots per week! Mebane Antique Auction Gallery puts families first by representing private individuals, collections, estate liquidation, and settlements. Mebane Auction has established a very competitive market by providing clients with accurate product information and pre-auction estimates. Families are put first by representing private individuals, collections, estate liquidation, and settlements. Every effort is made to keep auctions exciting and encourage patrons to make rewarding investments by offering absolute auctions with no minimums or reserves. Mebane Antique Auction Gallery is synonymous with traditional auction ethics and is regarded as one of North Carolina’s most reputable firms, a very important factor in today’s increasingly competitive antiques marketplace.